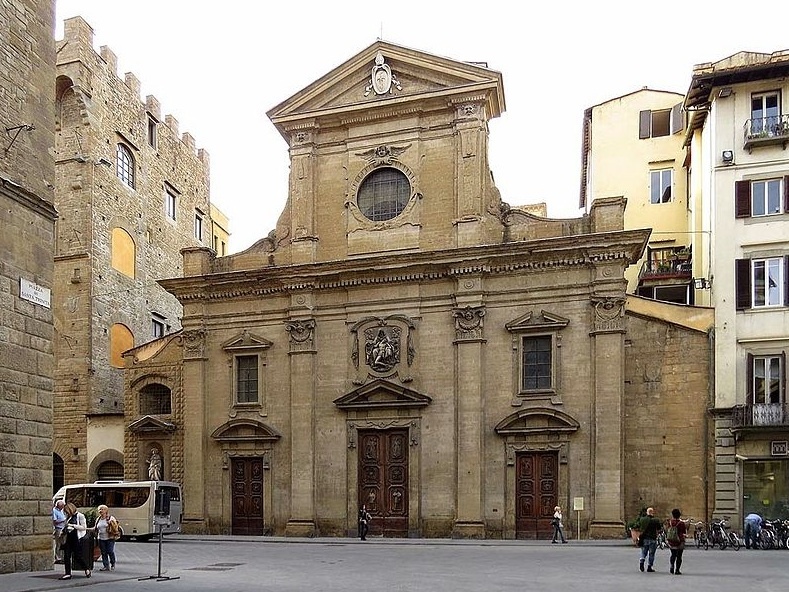 The church of Santa Trínita has stood on the west side of the piazza, in one form or another, since the 12th century; its unusual accent on the first syllable (from the Latin Trinitas) is considered to be proof of its ancient foundation. Although the rather pedestrian façade added by Buontalenti in 1593 isn’t very welcoming, step into its shadowy 14th-century interior for several reasons, beginning with the Bartolini-Salimbeni Chapel (fourth on the right), frescoed in 1422 by the Sienese Lorenzo Monaco, who artfully combined the elegance of International Gothic with the new ideas of the Early Renaissance. 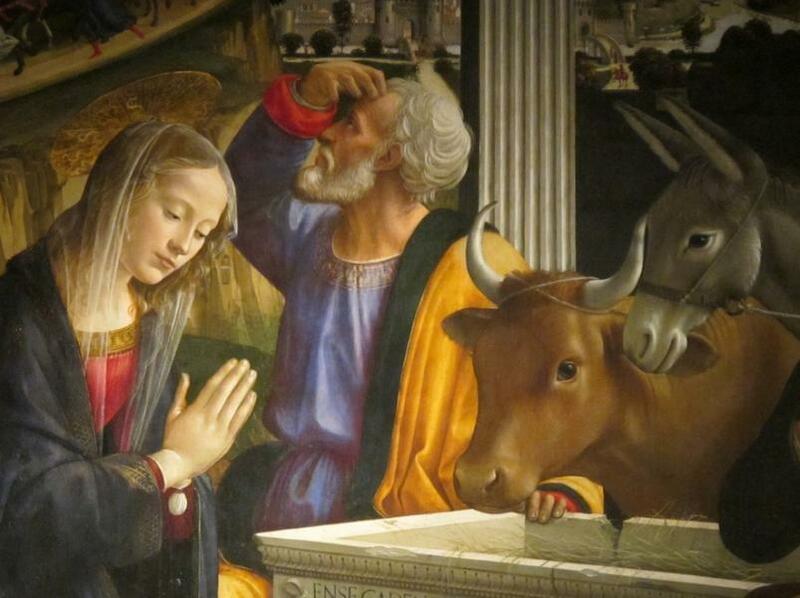 His Receiving of the Virgin on the left takes place in a wonderful Tuscan fantasy backdrop of pink towers. He also painted the chapel’s graceful, ethereally coloured altarpiece of the Annunciation. The Sassetti Chapel, the second to the right of the high altar, is one of the masterpieces of Domenico Ghirlandaio, completed in 1495 for Francesco Sassetti, general (and generally incompetent) manager of the Medici bank. The chapel is dedicated to the Life of St Francis, but also to the life of Francesco Sassetti, who commissioned Ghirlandaio to paint the chapel after the death of his son. The scene above the altar, of Francis receiving the Rule of the Order, is transferred to the Piazza della Signoria, where Sassetti (to the right, with the fat purse) and his boss, Lorenzo il Magnifico look on, while on the steps stands the great Latinist Poliziano with Lorenzo’s three sons. 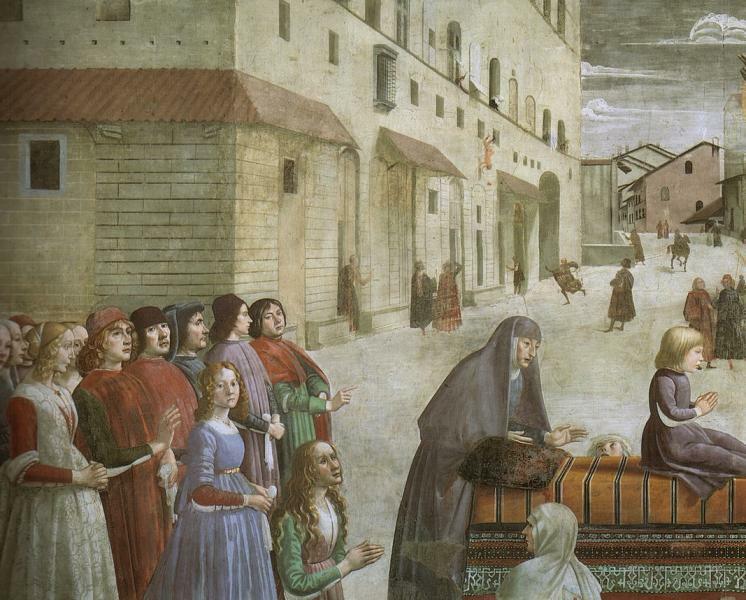 Another scene, the Miracle of St Francis shows the saint healing a boy who had fallen from Palazzo Spini, across the street from the church, showing Santa Trínita's original facade and the Ponte Santa Trínita, as it looked before the flood of 1557. The Death of St Francis pays homage to Giotto’s similar composition in Santa Croce. The altarpiece, the Adoration of the Shepherds (1485), is Ghirlandaio’s masterpiece, in its way the archetypal Renaissance painting. It is a contrived but charming classical treatment of a biblical scene – the Magi arrive through a triumphal arch, the stable is a ruined temple, the manger a Roman sarcophagus, while sibyls pose in the vault; the Tiburtine Sybil on the outer arch supposedly announced the birth of Christ to Augustus. To the right, the Sacristy contains some of the detached early 14th-century frescoes discovered under the 17th-century whitewash, including a Crucifixion and Noli me Tangere. Santa Trínita is a Vallombrosan church and the first chapel to the right of the altar holds the Order’s holy of holies, a painted crucifix formerly located up in San Miniato. The story goes that on a Good Friday, a young nobleman named Giovanni Gualberto was on his way to Mass when he happened upon the man who had recently murdered his brother. But rather than take his revenge, Gualberto pardoned the assassin in honour of the holy day. When he arrived at church to pray, this crucifix nodded in approval of his mercy. Giovanni was so impressed that he went on to found the Vallombrosan order in the Casentino, in eastern Tuscany. The Sanctuary was frescoed by Alesso Baldovinetti, but because he painted on dry instead of wet plaster only four Old Testament figures survive on the ceiling. Originally the golden Madonna and Angels, the Maestà di Santa Trínita by Cimabue hung over the altar, although now you have to go to the Uffizi to see it. In the second chapel to the left the marble Tomb of Bishop Benozzo Federighi (1454) one of the finest works by Luca della Robbia, and features his trademark enamelled tiles and terracotta in bouquets of flowers. On the north side of the nave, in the fourth chapel, a detached fresco is the masterpiece of Neri di Bicci, portraying San Giovanni Gualberto and his fellow Vallombrosan saints; over the arch you can see him forgiving the murderer of his brother, although it’s not easy to make out. Lastly, in the third chapel on the left, there’s a gold-ground altarpiece, the Coronation of the Virgin, by Neri di Bicci's dad, Bicci di Lorenzo (1430). Recent excavations uncovered remains of the original 11th-century church: there are traces of the Romanesque stone work by the door. They also found the crypt, although it's only open by request and usually by promising the sacristan to return the next day.